Words: Emily Huntington Miller, printed in "The Little Corporal Magazine," December, 1865. Sheet Music: James R. Murray, School Chimes, A New School Music Book (Cleveland: S. Brainard's Sons, 1874), No. 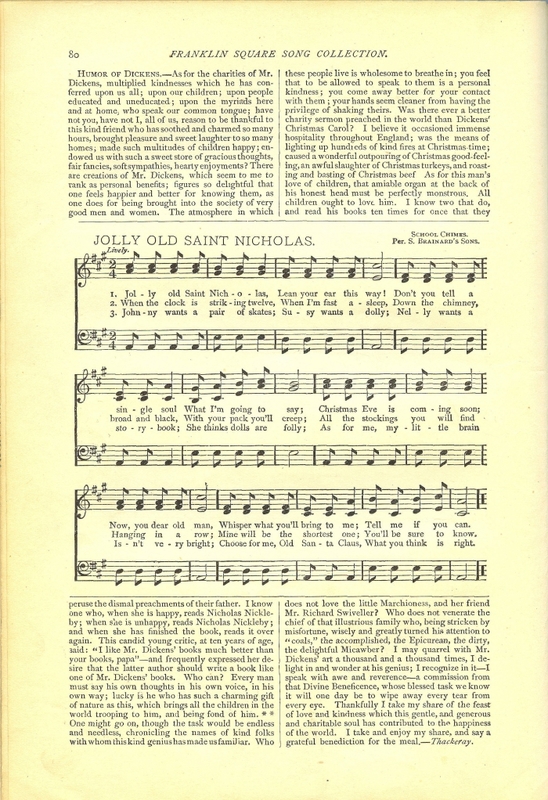 86, "Jolly Old St. Nicholas," p. 43. Christmas Eve is coming soon! Now, you dear old man. Tell me, if you can. 2. When the clock is striking twelve. 3. Johnny wants a pair of skates. One set of lyrics that are commonly sung are reproduced below. 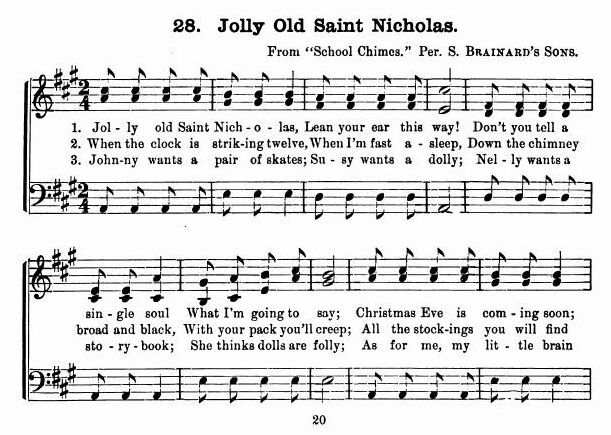 Sheet Music to "Jolly Old St. Nicholas" from James Ramsey Murray, ed., School Chimes: A New School Music Book. (Cleveland, Ohio: S. Brainard's Sons, 1874), No. 86, p. 43. Sheet Music from J. P. McCaskey, ed., Franklin Square Song Collection, No. 1. New York: Harper & Brothers, 1881, p. 80. The citation above the sheet music is to "School Chimes. Per. S. Brainard's Sons," that is, to James Ramsey Murray, School Chimes: A New School Music Book. (Cleveland, Ohio: S. Brainard's Sons, 1874), above. A musical setting can also be found in Roy Ringwald's Book Of American Carols, #111, pp. 238-241 (2004), who adds a fourth verse. This is the earliest publication that we've found these verses (so far). Emily Huntington Miller was an Associate Editor of "The Little Corporal Magazine" in December, 1865, and would later become Editor-in-Chief. This magazine merged with the St. Nicholas Magazine in 1875. Attribution elsewhere to Benjamin Russell Hanby is erroneous; Mr. Hamby was the author of a similar song, also in the 1860s, "Up On The Housetop." We hope "Gerty" will be pleased with the lines ... .
We understand that Emily Huntington Miller was also the author of the story in the January, 1866, issue of "The Little Corporal Magazine." We have been unable to access either of these two issues to date (as of Jan. 26, 2018). Late on the same morning that we conducted our research, we discovered that Dr. Mark C. Samples, Assistant Professor of Music and Coordinator of Musicology at Millikin University, had already confirmed that Emily Huntington Miller was the author of these lyrics. Dr. Samples published his findings, "Jolly Old St. Nicholas" in Tradition of Excellence Band Method, Book 1, by Bruce Pearson and Ryan Nowlin. San Diego: Neil A. Kjos Music Publishing Company, 2011. 1. Jolly old St. Nicholas, Lean your ear this way! Whisper what you’ll bring to me; Tell me if you can. Mine will be the shortest one, You'll be sure to know. Sheet Music from Eudora Lucas Hailmann, ed., Songs, Games and Rhymes for the Nursery, Kindergarten and Primary School (Springfield, MA: Milton, Bradley Co., 1887), pp. 20-21.